Vegan Eats and Treats! : Winner Dinner & Giveaway Winner! Winner Dinner & Giveaway Winner! First - the big news! Did you even know that a salad could be one of your favorite dinners ever?? I don't think I knew that. 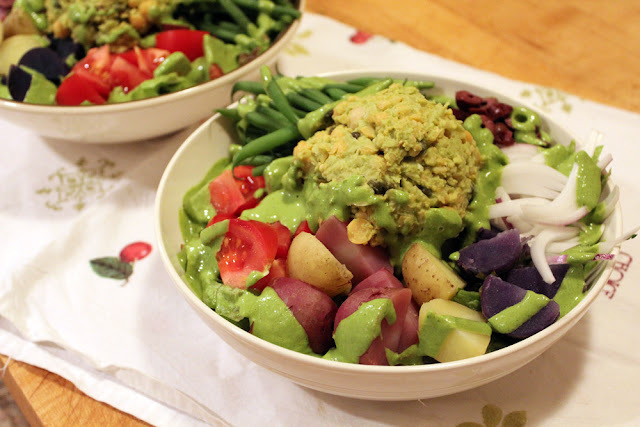 Over at the PPK Forums, I've so many rave reviews about the Salad Nicoise recipe from Appetite for Reduction, but I hadn't ever made it. But, inspired by pre-VVC week, I finally did, and I AM IN LOVE. Seriously, this isn't just one of my favorite salads ever, it's one of my favorite dinners ever! Light, filling, flavorful, beautiful, easy, delicious... it's a hands-down winner! Plus, look at my amazing baby potatoes that I got at the farmers market: I was so happily surprised that the red new potatoes were red on the inside too! And the purple potatoes were so purple! So much fun. 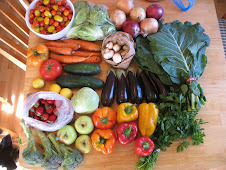 In fact, almost everything in the bowl is from the farmers' market - my favorite way to eat! I made that salad once and really enjoyed it. The dressing is nice... and I love potatoes, so it's a winner. Your colored potatoes look delicious. potatoes in a salad?? this looks awesome! Mmm, that looks so delicious. I love a salad that is nice and hearty like this. Thank you! I am so excited to try this baking book! And now I want the PPK book too, after seeing that salad!